– The conclusions of my report on IDS 2017 two years ago. 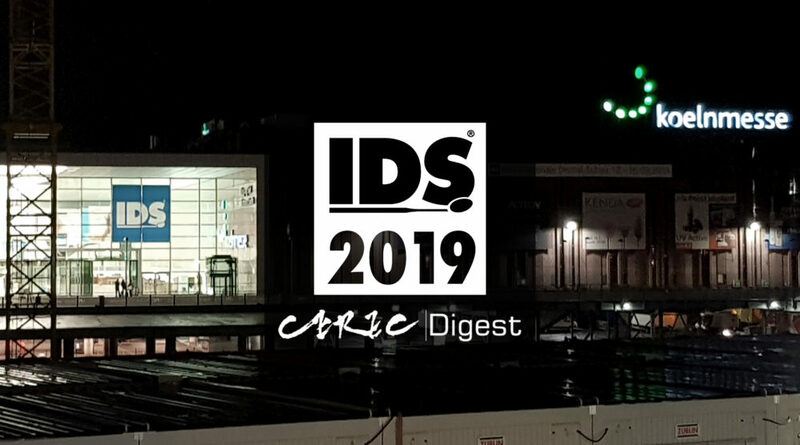 Indeed, two years later we saw digital dentistry becoming fully developed at IDS 2019. 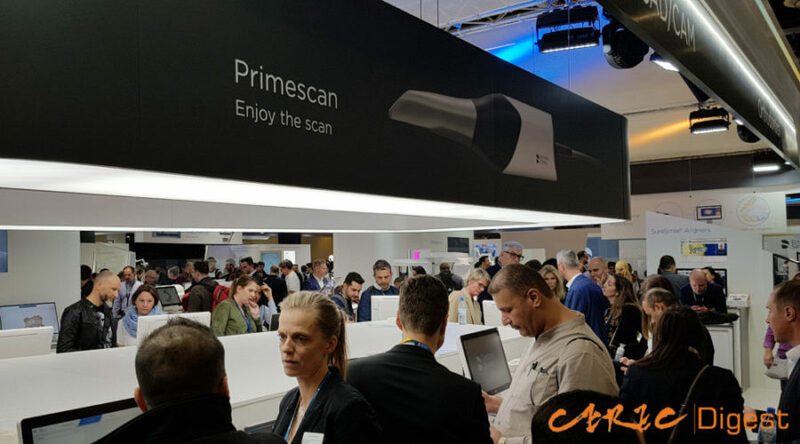 While the participating exhibitors has not changed in general (and most still had similar booth layouts and locations), intraoral scanners saw new advancements and new software that was capable of greater integration. The competition in milling machines has settled a bit, while a new battle has taken form in the 3D-printing market. At the same time, jaw motion tracking devices are simpler, implant navigation are struggling to survive against the overlapping niches of surgical guides, and the competition in zirconia ceramics has become more saturated than ever. Meanwhile, improvement of user interfaces, digital orthodontics, and patient motivators offered new possibilities for the road ahead. This report focuses on larger trends, and separate articles will follow to describe each topic in detail, so stay tuned! Most major manufacturers introduced a new-generation intraoral scanner this year. From the group that didn’t perform so well in 2017 (Carestream, Planmeca, Dentalwing, GC, iTero, and Medit), great progress has clearly been made. Some of these devices perform almost as well as the Omnicam and Trios devices from two years ago, and have reached the level where they are very suitable for everyday clinical use. Dentsply Sirona and 3Shape, which had already been the leaders in this field, tried to achieve new breakthroughs. For its part, Dentsply Sirona opted to continue strengthening the development of its intraoral scanners. Its Primescan scanner used an all-new scanning principle to achieve even faster data acquisition, even greater depth of field, and improved processing of signals from surfaces that are highly reflective or have little to no characteristics, and the scanner’s larger scanning sensor improves full-mouth scanning precision and increases clinical indications of digital therapies. 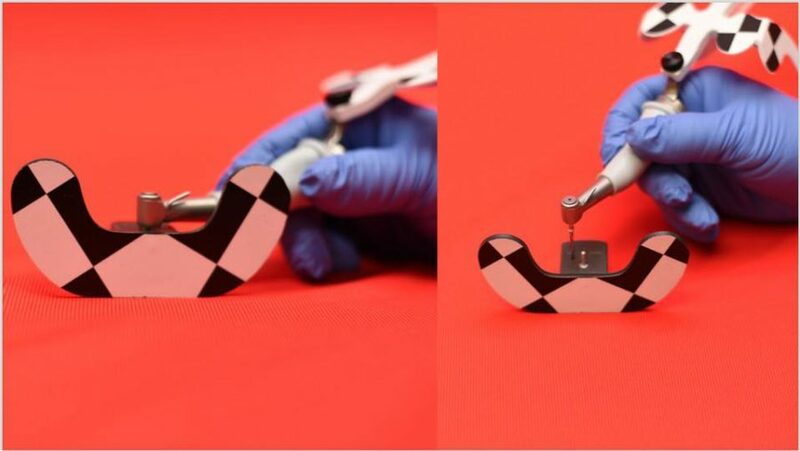 Building upon its Trios 3, 3Shape added new fluorescent and illumination functions to the Trios 4 that allow it to detect caries and cracks. The wireless version also has greater battery life. Interestingly, iTero and Planmeca both introduced devices with similar caries detection functions. I get the feeling that this level of competition is similar to the rivalry among smartphone manufacturers to introduce models with bezel-less display, multiple lenses, fingerprint-on-display functions, etc., and is a sign that the technology is approaching the end of a core development cycle. It also indicates that this is a good timing for most dentists to start using intraoral scanners, and they needn’t worry that the new devices will make the equipment they are current using obsolete. CEREC Primescan emphasizes good signal acquisition ability in the case of surfaces that are highly reflective or have no characteristics. 3Shape Trios 3 and Trios 4. Trios 4 has a unique fluorescent light caries detection function. In the wake of the growing split between chair-side and lab-side software that existed two years ago, we can say that competition in these two market segments has now settled into a relatively fixed pattern. 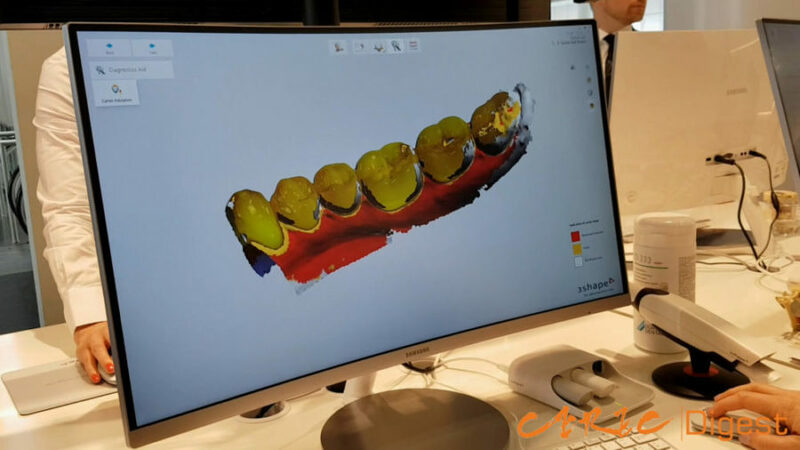 There are now full version of chair-side CAD with softwares designed by CEREC, 3Shape Dental System, and EXOCAD, and the softwares are now very user-friendly; the automated functions has ensured that non-technician users can easily learn to use the software. For its part, lab-side software has begun integrating multiple programs, and such functions as implant placement, CBCT, and prosthesis design—which previously required multiple programs—are now integrated within a single module. DSD and prosthesis design software have been evolving too, and are now often conveniently integrated in a single module. EXOCAD booth—this year’s slogan is ”Your freedom is our passion”. Two year ago, it felt like almost one out of every three booths was selling milling machines. Now that competition has subsided, Amann Girrbach, Imes-icore, VHF, DGSHAPE (Roland), and Ivoclar Vivadent are the main surviving competitors. We can tell which products are favored in the industry by how often they appear under another brand name, Amann Girrbach is currently the leading OEM producer on behalf of other brands. Unlike in the past, not all milling machines are now multi-purpose devices, and there is beginning to be some differentiation between chair-side and lab-side machines in response to different needs. Amann Girrbach has even established a new brand name called “IDC” for its chair-side machines, and I plan to write another article discussing how the machines are different. Another major feature consists of improved user interfaces. All the brands have abandoned their past “industrial style” appearance, eliminated complex designs, and have instead switched to simple and easy-to-understand graphic interfaces. As a result, operation is more intuitive. We can see that these companies have designed their new products from the user’s perspective. 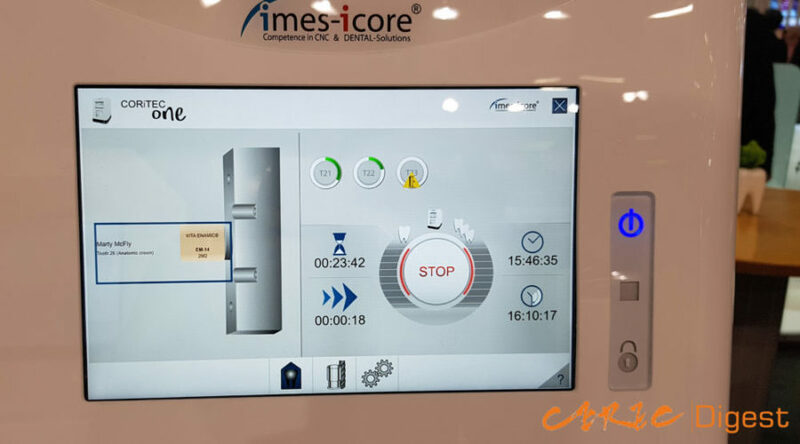 Imes-icore’s differentiated products—The first machine on the left is a key product introduced this year: CORiTEC One. 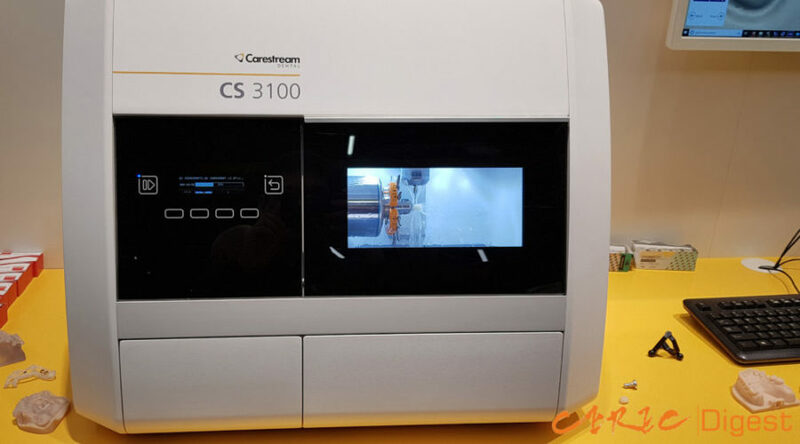 The CS 3100 is manufactured by Amann Girrbach, and bears the Carestream brand. The special milling processes: Carving mode. In place of the battle to dominate the milling machine market, a new conflict has broken out over the 3D printer market. 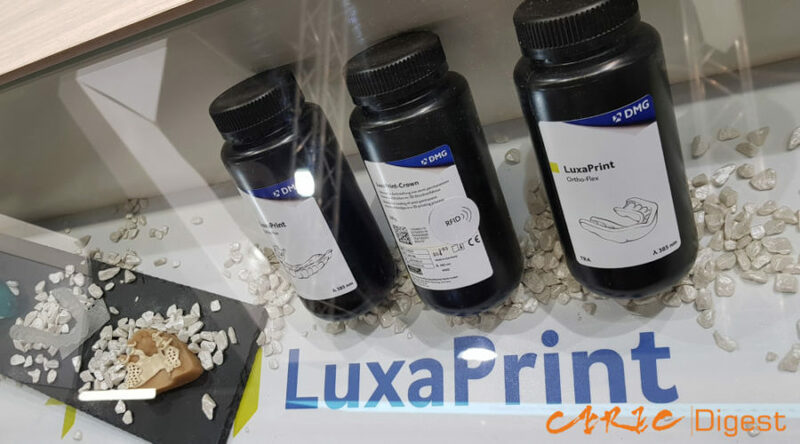 Resin printers occupy the mainstream of this market, and even when the leading brands have not developed their own 3D printers, they still displayed OEM printers bearing their own brand names. 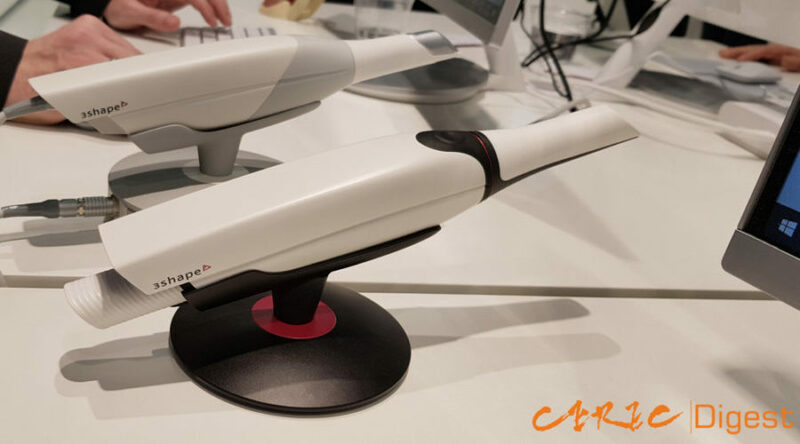 Probably the most common label we saw at IDS was Rapidshape. Because close attention must be paid to the shrinkage of the printing material, the integration of “printing, cleaning, and light-curing” components in conjunction with printing material together is the sign of a mature manufacturer. Ivoclar Vivadent’s heavyweight product this year was the PrograPrint, which had very simple printing, cleaning, and light-curing workflow, and also featured and integrated material cartridge and printer tank design that ensures changing material is quick and simple. Pure materials manufacturers have also not been idle, and have introduced a dazzling variety of printing fluids for various indications. 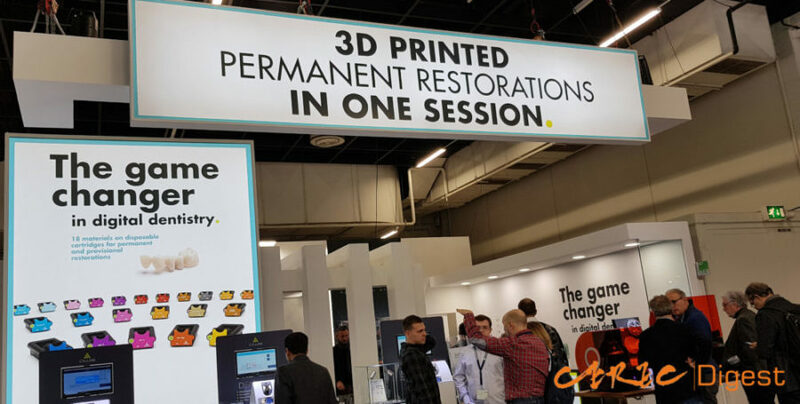 Among them, Temp materials seems to be the most popular, and even such a conventional firm as DMG introduced the LuxaPrint, while GC also introduced Temp Print to capture a share of the 3D-printing market. No metal printers suitable for chair-side use were seen at IDS. I don’t think that metal printers will ever really take off in clinics unless the commercial value of RPDs and metal crowns is improved. New developments have occurred in zirconia printers. 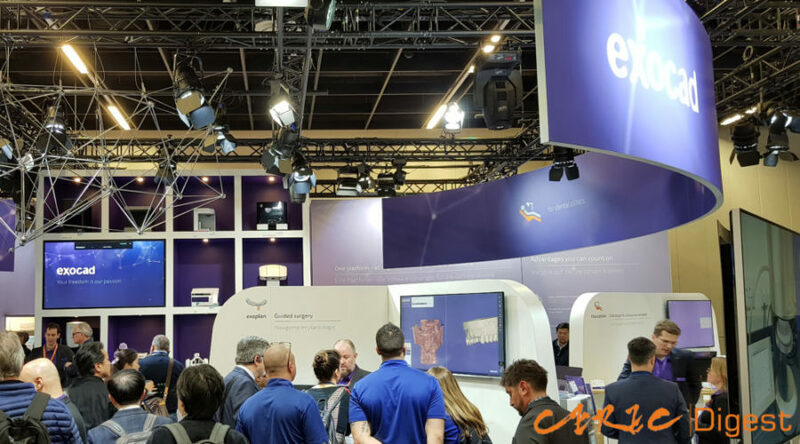 But while there were two firms, DWS and Lithoz, offering zirconia printers solutions and displaying products, determining their precision and strength will require many tests and verifying reports. A key product from Ivoclar Vivadent: The three elements of the PrograPrint system. 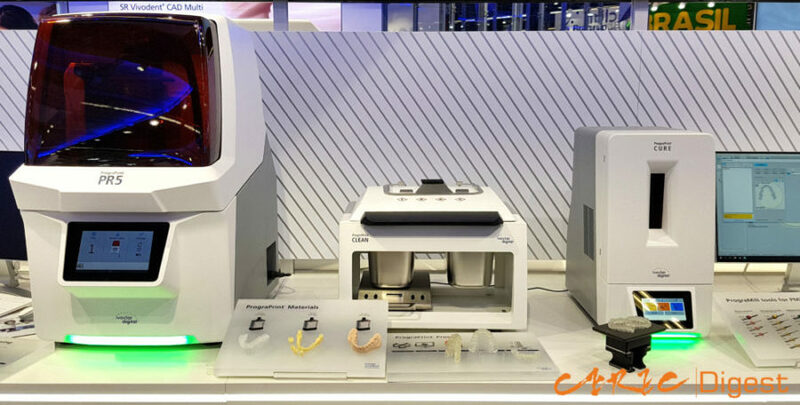 Always at the forefront of 3D printers: Zirconia printer technology introduced this year by DWS. DMG LuxaPrint crosses over into a new market. DETAX introduces multipurpose printing material. The technological mainstream of jaw motion tracking devices has started to shift toward optical detection (such as Modjaw seen two years ago). Zebris introduced an all-new Optic Jaw; although its software hasn’t changed very much, its use of optical principles have allowed a reduction in the weight and simplification of the digital face bow—which has induced other companies to sell this product under their own brands. Design software, such as EXOCAD adding integration to jaw motion tracking software, has begun to gradually feature improvements; although this is a relatively small market niche, because of its importance in digital full-mouth reconstruction, it should not be neglected. The Optic Jaw, which is manufactured by Zebris and shown here bearing Amann Girrbach’s brand, shares the same design language as the Artex articulator. In spite of the fact that surgical guides represent the market mainstream, a few manufacturers of implant navigation still displayed their wares at the recent IDS. Unlike the much maligned bulky handpieces and optical equipment of the past, current devices are much later and more compact, offer quicker positioning, and have reasonable prices. As a result, these Implant navigation still hope to compete on even terms with surgical guides. 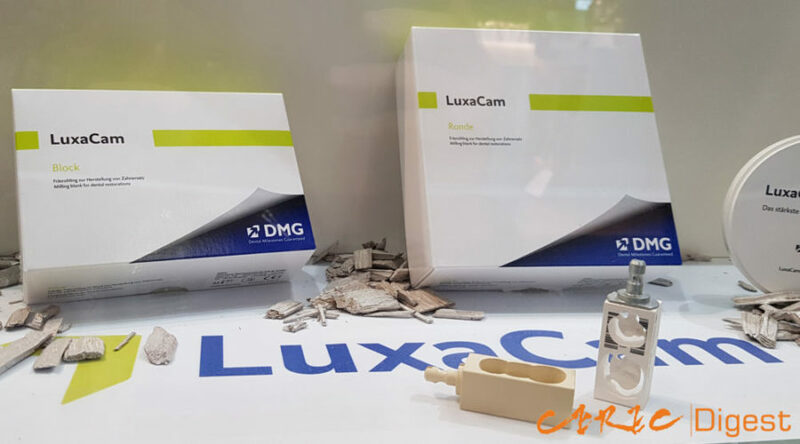 No special new products were seen in the area of glass ceramic blocks, and digitally-oriented ceramic blocks, including multilayer, zirconia reinforcement, and hybrid products, have taken the lead in this market. Only GC was ready to do battle with its Initial® LiSi product. Zirconia, especially the cubic zirconia sometimes known as third-generation zirconia, was seen everywhere displaying gradient colors, which is now a standard for all manufacturers. The market leading Katana displayed long zirconia blocks for use in chairside bridges, and also shortened sintering time to 18 minutes. Ivoclar Vivadent also introduced its new ZirCAD Prime. 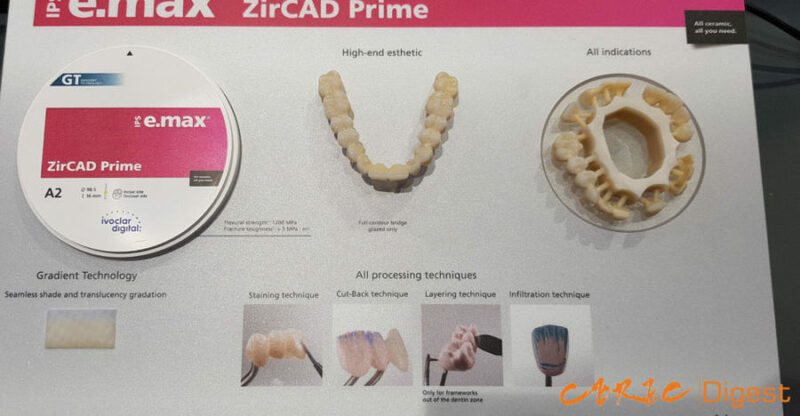 Large numbers of new zirconia products introduced by VITA . Ivoclar Vivadent’s ZirCAD Prime gradient zirconia. Of course DMG did not forget its LuxaCam. 8. Improved hardware user interface, digital orthodontics, and patient motivators offer new possibilities for the road ahead. At a time when digital dentistry technology has already reached the saturation point, I feel that the there is still room for improvement. I could see this year that manufacturers had put great effort into making their intraoral scanners, design software, milling machines, and printers simpler. After all, since the final users will be dentists, technicians, or assistants, assuming that the quality of different products is similar, it is the products that are easiest to use that will be most popular. The development of digital orthodontics has only really gotten underway after the expiration of the Invisalign patent. Because of its late development, digital orthodontics products have made great strides every time I see them, and their future developmental direction will be toward greater adjustability while performing automatic calculations. I began seeing many more types of software intended to increase patient motivation at this IDS, and most took the form of tablet apps. 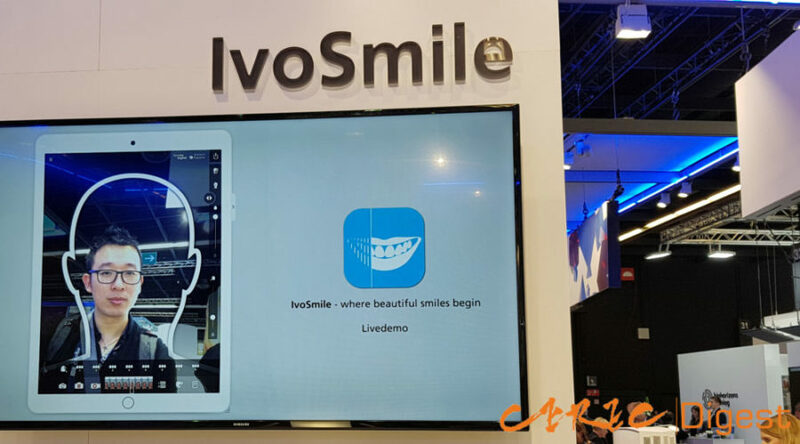 The Kapanu smile simulation software that I saw two years ago has been purchased by Ivoclar Vivadent and re-introduced as the IvoSmile, which incorporates many practical functions, as well as more precise AR positioning. The DSD app introduced by Coachman also has similar functions, but I did not see it at the recent IDS. 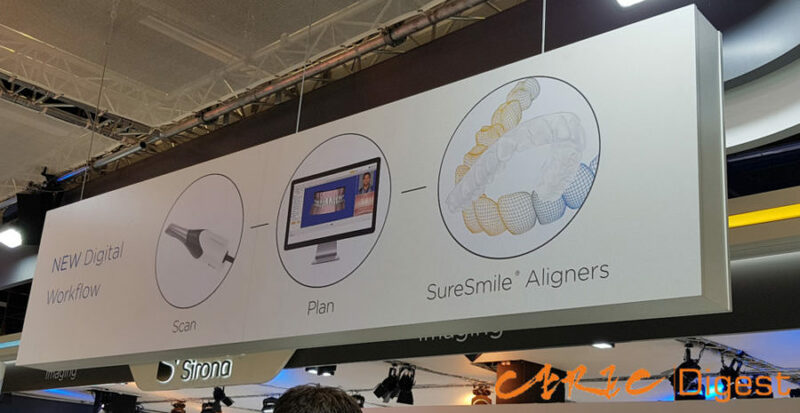 The orthodontic software introduced by Dentsply Sirona, 3Shape, and Align also contains programs capable of rapidly displaying simulation results. It seems as if manufacturers have discovered the importance of marketing in digital dentistry. By boosting dentists’ business, effectively marketed products can also indirectly increase the manufacturer’s own sales. Greatly improved graphic milling machine user interfaces. Dentsply Sirona’s clear aligner solution: SureSmile. Kapanu software purchased by Ivoclar Vivadent and renamed IvoSmile. The SoftCeram COLOR—an inkjet printer intermediate between a 2D and 3D printer. Do you remember this movie segment? Correct, the function of this machine is internal staining, and it can be called a zirconia staining machine. 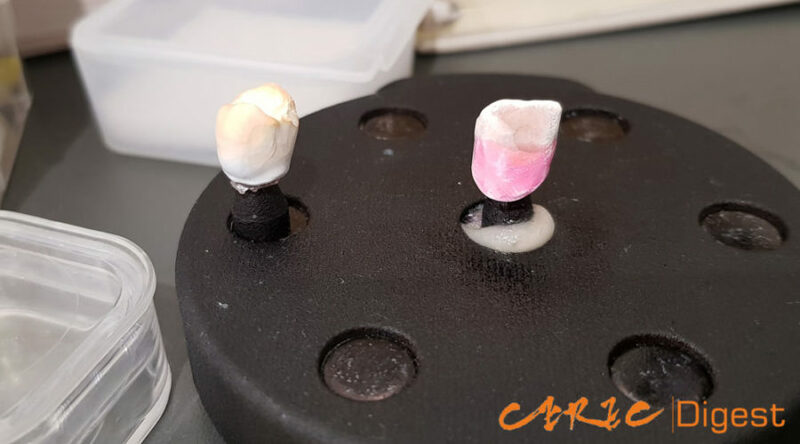 When you place an un-sintered zirconia crown in the printing chamber, the machine will first scan the exterior of the object, and then use its software to design the gradient and color that you require. It uses an inkjet mechanism to precisely spray zirconia staining agent in the desired shades. This is the last mile in digital dentistry. During my teaching experience of the last few years, I found that the chair-side procedure that my students worry most about is not the digital process of scanning, design, or milling, but instead the post-processing after milling. Although the function of this machine is currently limited to the internal staining of zirconia, if a similar concept can be developed further, when an inkjet printer can be used to stain glass ceramics, while allowing us digitally enter the scanned tooth color and characteristic, and it will then be possible to perform scanning, design, milling, external staining, and glazing in a single machine—a “pure” digital workflow can be fully realized. I look forward to when this day comes. 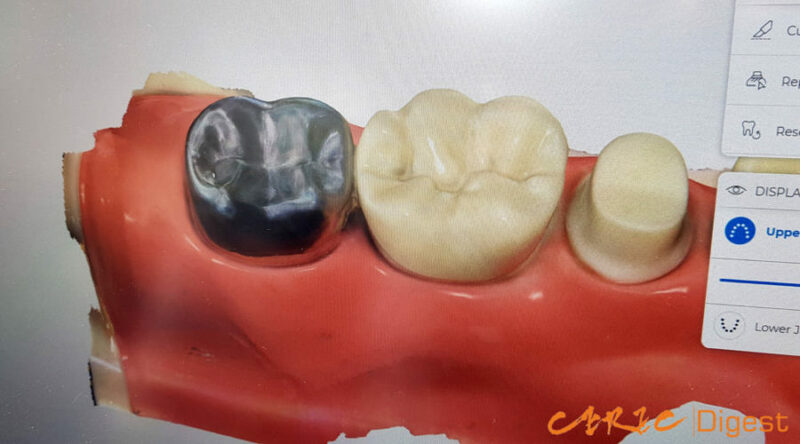 SoftCeram COLOR, digital zirconia internal staining machine. Different gradient colors can be seen after inkjet printing. 2019 will be remembered as the year in which digital dentistry firmly occupied a mainstream position. All the major brands have perfected digital workflows, and all materials vendors offer complete product lines. As far as those dentists who have already embraced digital dentistry for a number of years are concerned, their freedom of treatment has been broadened even more, and various types of treatment methods embodying innovative thinking will be springing up. As for those dentists who have not yet adopted digital methods, the options are all relatively safe, and there is little chance that a dentist will be constrained by a poor choice of brand. After visiting two IDS, I feel that I have observed a natural ecosystem: The strongest have gotten even stronger, while the weak have quietly made their exit. Some technologies that originally induced high expectations have vanished, and some unremarkable technologies are still at the conceptual stage. However, many new ideas are flourishing. In view of digital dentistry’s highly developed state, what new leaps forward will we see two years from now? I think it will be difficult to improve significantly on current hardware, but we can expect to see more software progress and automation. Nevertheless, I still look forward to IDS 2021 giving me some unexpected surprises.